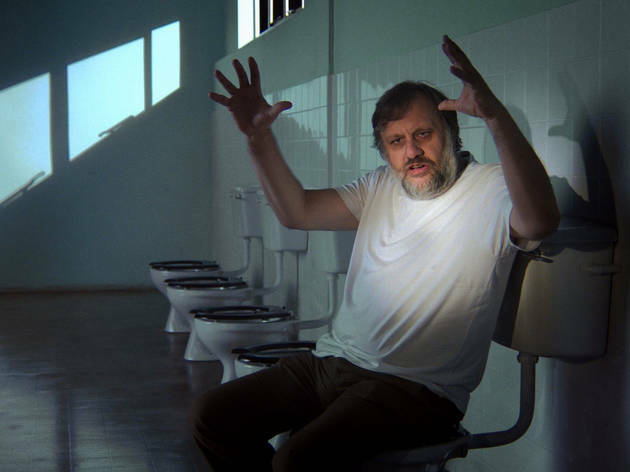 Sophie Fiennes’s 2006 film, The Pervert’s Guide to Cinema, made a movie star of charismatic Slovenian philosopher Slavoj Zizek, albeit not of the Ryan Gosling breed. With his salt-and-pepper beard as luxuriant as his Slovenian accent, Zizek’s screen presence is at once crazed and disarming: No matter how outwardly impenetrable his theories, the manic conviction with which he expresses them makes them compelling. This lengthy but rollicking follow-up may eliminate the word cinema from its title, but the song remains the same. Tackling a range of popular film titles—everything from John Carpenter’s They Live to Cabaret—Zizek riffs relentlessly on the ideas and ideologies embodied in each; hardly any film, the thinker posits, is about what it claims to be about. (His take on Titanic is particularly disheartening for romantically inclined viewers.) It’s exhilarating, even exhausting stuff, though Fiennes lightens the weight of Zizek’s dense discourse with a welcome scattering of sight gags. He’s a man to be taken seriously, but not averse to donning a nun’s habit—and for that we love him.